Samuel Adams was an American statesman, political philosopher, and one of the Founding Fathers of the United States. 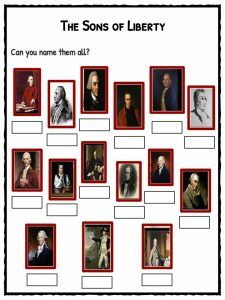 He is best known for helping to organize the Boston Tea Party and signing the U.S. Declaration of Independence. The biography below includes Samuel Adams facts, information and events in the life of one of the most important men in the American Revolution. 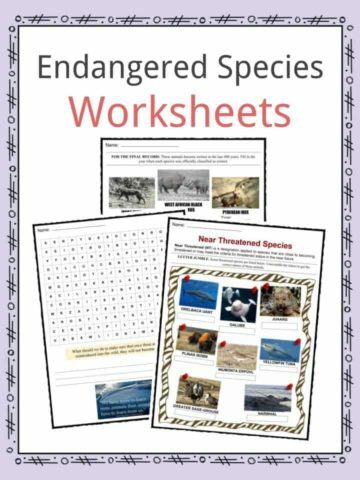 Alternatively you can download the comprehensive worksheet pack which can be utilised within the classroom or home environment. 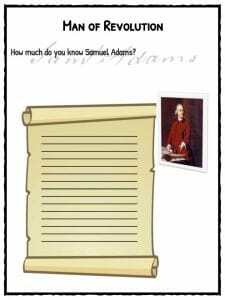 Samuel Adams was born on September 27, 1722, in Boston, Massachusetts. He was one of twelve children born to his parents, Samuel Adams, Sr., and Mary Fifield. 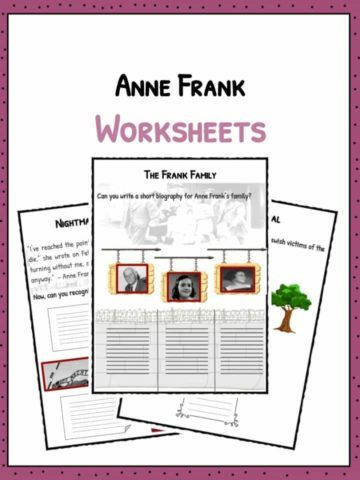 Only three of their children lived past their third birthday. His father was a political leader and church deacon. Samuel learned a lot about politics, religion and the rights of the colonies from his parents. Adams went to Harvard. 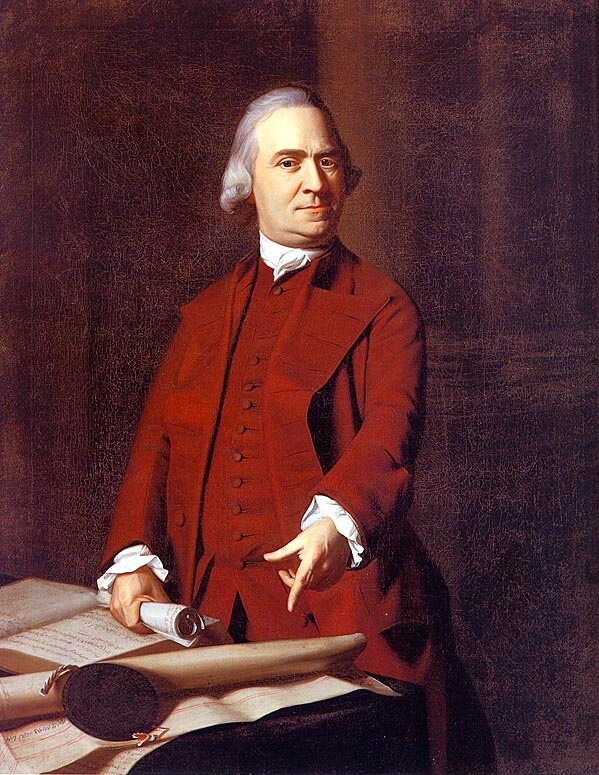 When he was 14, Samuel Adams attended Harvard University, studying politics and history. He graduated in 1743 with a masters degree. 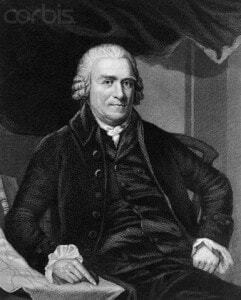 Samuel Adams formed a group of Patriots called The Sons of Liberty. After the British government passed the Stamp Act of 1765, he became angry that the colonies were taxed without having a representative in the government. He formed Sons of Liberty to protest against the king and his taxes. They became a very influential group against the British. He protested the Sugar Act of 1764, the Stamp Act in 1765, and the Townshend duties in 1767. He encouraged economic boycotts of British goods and hung a dummy of a British Tax Agent to protest the Stamp Act. The Sons of Liberty movement spread across the colonies. In New York they became particularly strong and protests became violent in an attempt to scare loyalists during the Revolutionary War. He was elected to the Massachusetts Assembly as a legislator in 1765. He helped to organize resistance to the Stamp Act through the Stamp Act Congress, which was a meeting of American colonies to devise a unified protest against British taxation. Samuel Adams played a vital part in organizing the Boston Tea Party. The exact nature of his involvement is still unknown. He founded Boston’s Committee of Correspondence. There were similar committees in towns across the colonies, and they were a powerful tool for communicating and coordinating with each other during the American Revolutionary War. In 1774, Samuel Adams was chosen to represent the Massachusetts colony at the First Continental Congress. He was one of five delegates chosen to protest taxes by sending a letter to King George III. 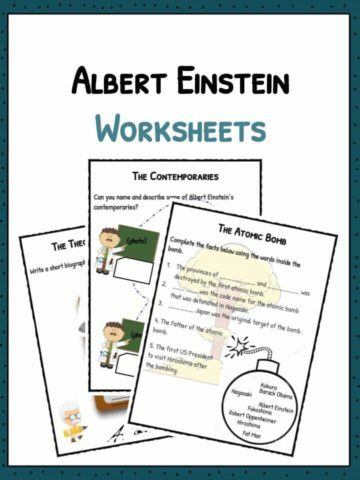 The American Patriots began to gather weapons. Adams returned to Massachusetts in November 1774 and served on the Massachusetts Provincial Congress. They created the first minutemen companies, consisting of militiamen that were ready for action on a moment’s notice. 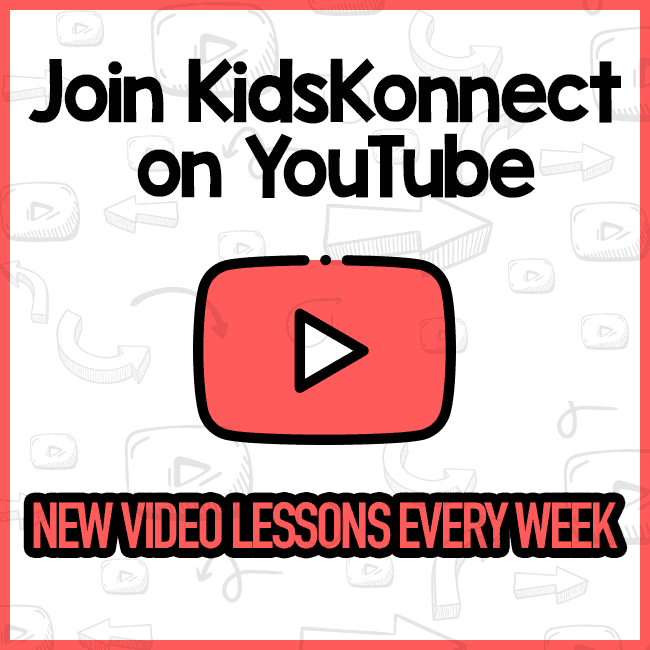 In April, 1775, the British army marched to Concord, Massachusetts. They wanted to destroy patriot weapons stored there and arrest Samuel Adams and John Hancock, another patriot leader. Adams and Hancock were able to escape thanks to a warning from Paul Revere, but this marked the beginning of the American Revolution. 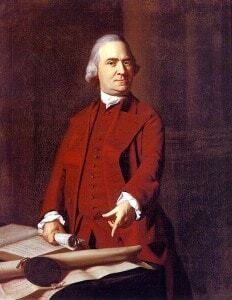 Samuel Adams signed the Declaration of Independence on July 4, 1776. His signature is one of five from the Massachusetts colony. The other signatures were John Adams (his cousin, and future president of the United States), John Hancock, Robert Treat Paine and Elbridge Gerry. He became a state senator, and eventually governor of Massachusetts. He was a Democratic-Republican and served as governor from 1794–1797. Samuel Adams died on October 2, 1803 at 81 years old. 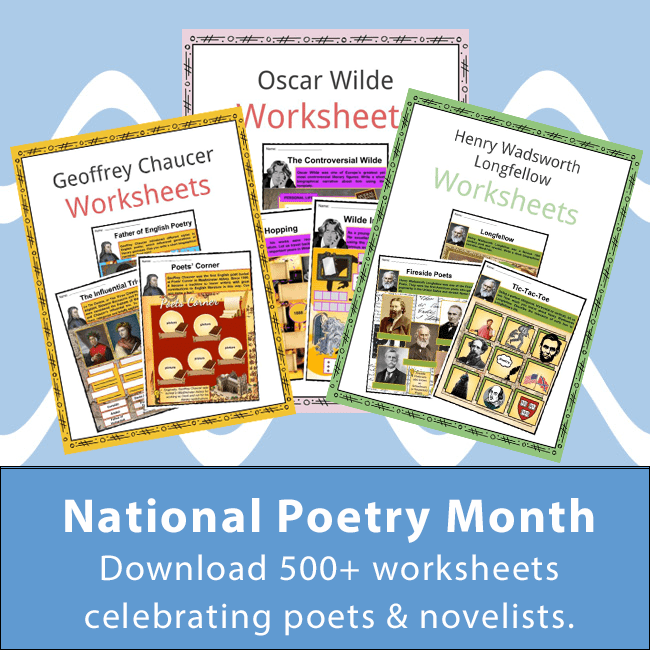 It is believed that he was a sufferer of an essential tremor, a movement disorder, that left him unable to write for the final decade of his life. Portrait of Governor Samuel Adams (1722-1803). He is regarded as one of the true leaders of the American Revolution. Thomas Jefferson referred to him as “truly the Man of the Revolution.“. 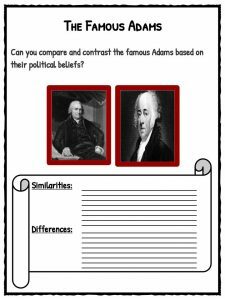 When his cousin, John Adams, travelled to France during the revolution, he had to explain that he was John and not Samuel Adams, “the famous Adams”. He was praised by supporters of the Revolution, but Loyalists viewed him as sinister. A political rival, Thomas Hutchinson, referred to Samuel as a dishonest character assassin, bringing up his failures as a business man and tax collector. He inspired the Boston Beer Company to name a beer, Samuel Adams Boston Lager, after him. The beer was first created in 1985 and went on to become a popular and award winning brand. 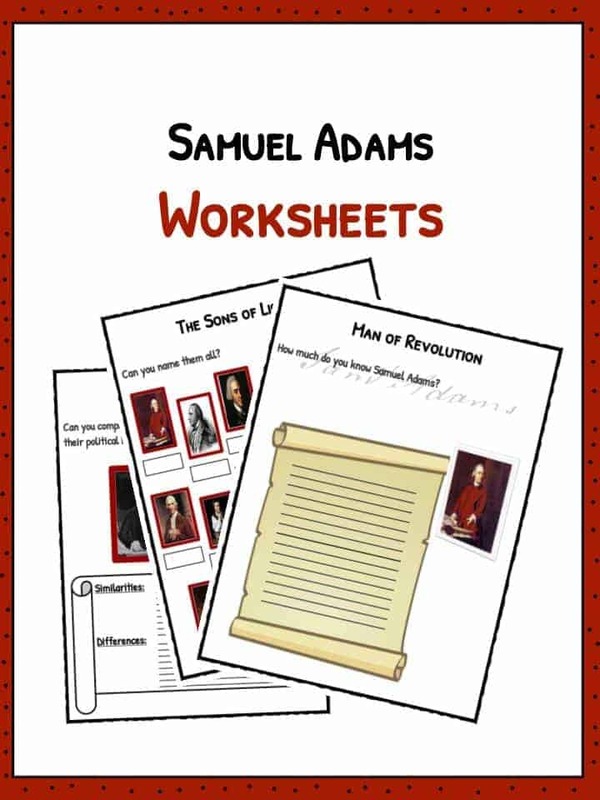 This bundle includes 11 ready-to-use Samuel Adams worksheets that are perfect for students to learn about Samuel Adams who was an American statesman, political philosopher, and one of the Founding Fathers of the United States. He is best known for helping to organize the Boston Tea Party and signing the U.S. Declaration of Independence.